Kent Monkman’s Two Ships was unveiled for two days only at 6 Degrees Citizen Space 2017 in Toronto, Sept. 25-27. 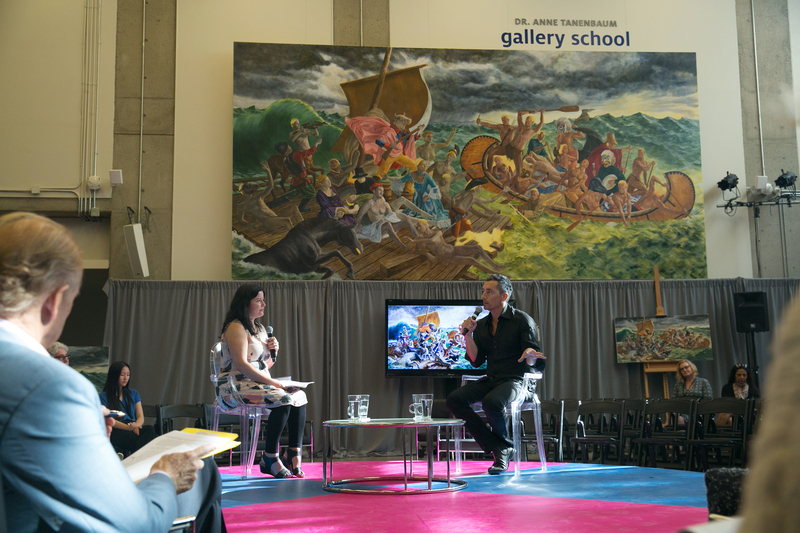 During an exchange session, Kent Monkman spoke with curator Wanda Nanibush about the monumental piece. The exchange was recorded and is available for viewing below. Can art disrupt dominant culture narratives of history, religion, and sexuality? 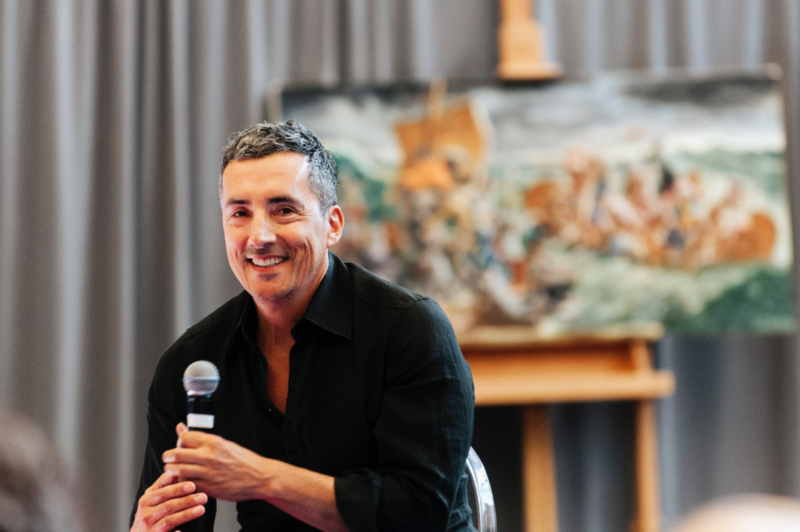 With Two Ships, his largest ever history painting, Kent Monkman returns to a theme that has animated much of his work — the exclusion of Indigenous histories and perspectives from the canon of European art history. The 12-by-24-foot painting is an allegory for the Two Row Wampum Treaty, an agreement between the Dutch and the Haudenosaunee in 1613 that laid out a policy of mutual non-interference. The painting, depicting the collision of two vessels — the raft of Medusa and a war canoe — talks back to European colonialism and the betrayal of the promise of non-interference. Joined on stage by Wanda Nanibush, the inaugural Assistant Curator of Canadian & Indigenous Art at the Art Gallery of Ontario, Monkman talked about the layering of references in his work — paying homage to Bill Reid; referring to and reworking French painters Delacroix and Géricault; and speaking back to Canadian painter Paul Kane’s appropriation of Indigenous representations. The bringing together of characters and objects that wouldn’t have existed at the same time points to the notion that received History itself is a fiction, said Nanibush. The two were also joined on stage by Bernhard Schlink and John Ralston Saul for a discussion of the influence of Cree storytelling on Monkman’s work, the role of the artist, and the importance of having Indigenous curators in cultural institutions.